Papua New Guinea has been refered to as the "Last Frontier" for agarwood (also called eaglewood, oud or gaharu) in natural forests. In PNG, species of Aquilaria and Gyrinops produce agarwood and trees may be found in relatively large numbers at some remote forest locations. The genus, Gyrinops, is closely related to Aquilaria and in the past all species were considered to belong to Aquilaria. Morphological differences suggest to some researchers, however, that Gyrinops is a more appropriate genus to classify the trees growing in PNG. Agarwood was first discovered and harvested here in the late 1990's. Although the harvesting of trees for agarwood began only a few years ago, there are serious concerns that indiscriminate cutting will rapidly deplete the natural Aquilaria and Gyrinops resources as it has in Vietnam and other countries. To prevent this from happening a program for the sustainable production of agarwood has been initiated. Our work in PNG, in cooperation with the Rainforest Project Foundation and the United Nations Food and Agriculture Organization, includes research and training programs for rural villagers to produce cultivated agarwood. The sustainable management of Papua New Guinea's agarwood will help protect and preserve old growth trees while supplying cultivated agarwood from managed forest sites. Our training programs and workshops are bringing new technology to the people of PNG. Pilot field demonstration sites are being established in four provinces (Central Province, East Sepik Province, Enga Province and the Gulf Province). These research and training efforts are an enormous endeavor and we actively seek new funding sources to carry out this important work. If you or your employer are interested in supporting our efforts, tax deductible donations can be made to a special fund at the University of Minnesota. See the "contributions page" of this web site. For more general information about the people and natural history of Papua as well as knowledge about other indigenous people of the world see TRIBE, a BBC educational web site. Old growth Gyrinops tree growing in the tropical forests of Papua New Guinea. Villagers at one of the pilot demonstration sites learning methods to produce cultivated agarwood using sustainable management practices. Gyrinops seedlings growing under mature trees in the forest provide a resource for the future. Pilot demonstration sites are used to transfer agarwood inducment technology to the villagers. Mr. Joel Jurgens from the University of Minnesota and Margaret Singadan from the Forest Research Institute of PNG discuss methods in a field training session. Establishing an agarwood management project for PNG at the Forest Authority Headquaters. 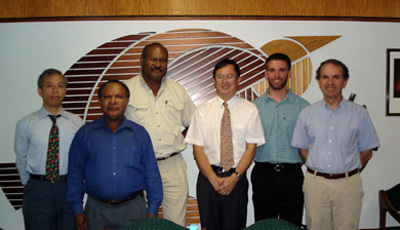 From left to right Mr. Masakazu Kashio, United Nations FAO Forest Resources Officer; Mr. Dike Kari, Director, PNG National Forestry Service; Mr. Brown Kiki, General Manger, PNG National Forestry Service; Mr. Heuveling van Beek, Director TRP; Mr. Joel Jurgens and Professor Robert Blanchette, University of Minnesota. 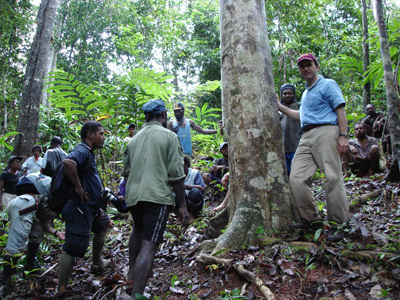 Mr. Roy Banka, PNG Forest Research Institute with Professor Blanchette and others in a remote forested area examining a large Gyrinops tree. Old growth trees are being protected so they can be used as a source of seed to propagate new trees for the village and maintain biodiversity in this tropical forest. Villagers discussing the techniques to cultivate agarwood. These new methods will provide a new non-timber forest product to aid the ecomomy of local communities. Small trees are used to produce agarwood and new trees planted for future use. Here villagers learn to treat young trees for agarwood production. 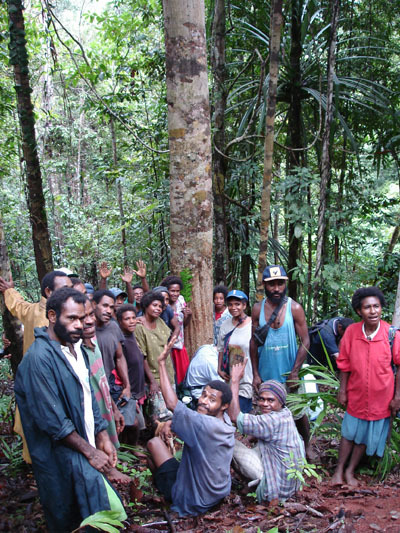 The agarwood management project is bringing new hope to rural people of Papua New Guinea. It will provide a new economy for the poor from this non-timber forest product, protection of old growth forests and preservation of tropical rainforest biodiversity as well as a cultivated source of agarwood that people throughout the world can enjoy.